Fabergé was founded in 1842 by Gustav Fabergé, but it was his son Peter Carl (1846-1920) that truly drove the family business to new heights. Peter Carl Fabergé’s story is a European one. Born into a Huguenot refugee family in St. Petersburg, Russia, he relocated some 14 years later with his family to Dresden, Germany. After extensive studies and travels in central Europe, Fabergé finally returned to the place of his birth a fully trained craftsman. The year was 1870, and Russia was in the throes of the luxury-hungry tsarist regime. Peter Carl Fabergé took over the Fabergé jewelry shop on Bolshaya Morskaya Street in St. Petersburg that his father Gustav had opened in 1842. And it was here that he instituted a new system of workshop masters to oversee and create objects in Fabergé’s name and style. His workshop masters – exceptional craftsmen all – attained fame of their own throughout the years and helped Fabergé create a legacy of more than 150,000 objects. Throughout the century and more since Fabergé entered the world’s jewelry stage, it has been best known for two things: translucent enameling over guilloché and Easter eggs, both of which actually go hand in hand. That same year, 1885, Tsar Alexander III also commissioned his first Easter egg from Fabergé as a gift to his wife, Empress Maria Feodorovna. This became a yearly tradition, with Fabergé creating 50 eggs in total for the Russian court. The Russian imperial family took the Easter tradition of giving eggs (a symbol of new life in the springtime) as gifts very seriously. These eggs were exuberant showcases of traditional decorative techniques such as gem-setting, hand-turned guilloché, and high-fire enamel. At the heart of most of those eggs was a surprise — automata, miniature paintings, and jeweled replicas of places and objects significant to the imperial Romanov family. Between 1885 and 1916, Fabergé created fifty egg-shaped Easter gifts for the tsar’s family, most of which were commissioned as surprises. The first imperial egg, a simple chicken egg containing a golden bejeweled hen, was, as previously mentioned, a gift from Tsar Alexander III to his Danish wife, Empress Maria Feodorovna. And from that point, the legacy only grew. 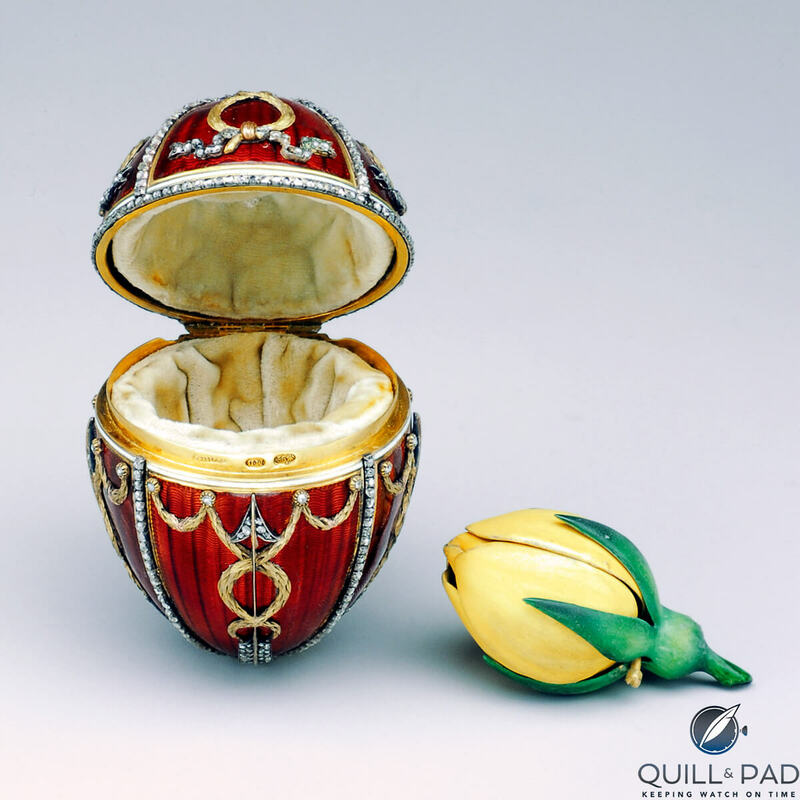 The Hen Egg, now located at the Fabergé Museum in St. Petersburg, features an opaque white enameled shell. When opened, a matte yellow gold yolk is revealed. The yolk in turn contains an enameled and chased gold hen that once held a replica of the Russian imperial crown with a ruby pendant (the empress’s Easter gift). Fabergé made ten eggs in the eight years before Tsar Alexander III’s death. The Fabergé workshop created another 40 eggs between 1893 and 1916 during the reign of Alexander III’s son, Nicholas II: two appeared each year, one each for mother and wife. Another of these eggs, also at home at the Fabergé Museum in St. Petersburg, is the Rosebud Egg of 1895, which Nicholas II presented to Empress Alexandra Feodorovna a few months after they married. Comprising multi-colored gold, rose-cut diamonds, and translucent red enamel over guilloché, the inside surprise is a miniature portrait of the emperor underneath a table-cut diamond. Other jewelry surprises contained therein have been lost. 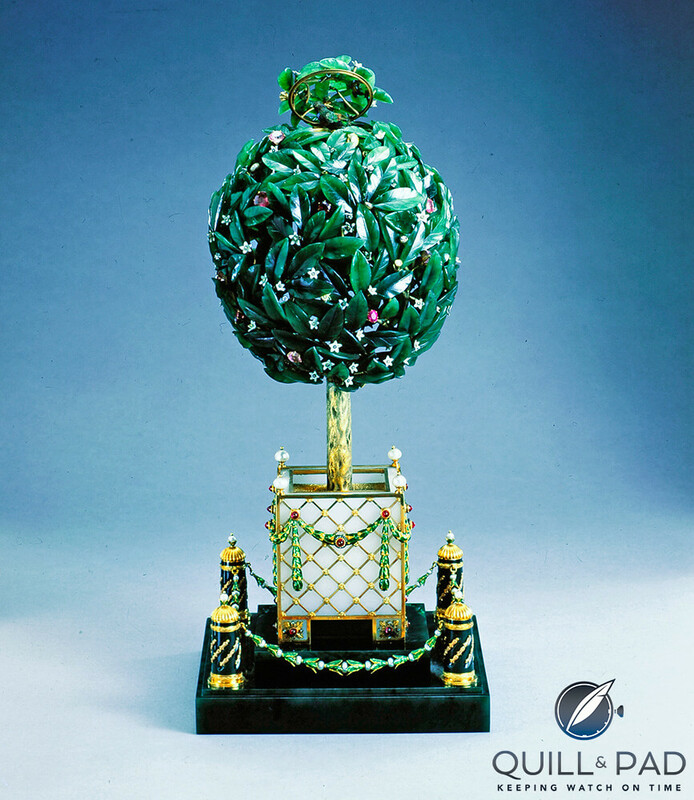 While the eggs were unlikely to have been very profitable to the jeweler’s business due to the enormous amount of craftwork and precious materials that went into them, Fabergé was very proud of them. Nicholas II gifted his new wife the Coronation Egg of 1897 on the day of their coronation in Uspensky Cathedral. The design of the egg comprising multi-colored gold, translucent yellow enamel over guilloché and black double-headed eagles set with diamonds was reminiscent of the radiant cloth of gold robe she wore that day. The little gold coach surprise, an enameled gold miniature replica (only 9.4 centimeters in length) of an original eighteenth-century carriage by Buckendahl, took craftsman Georg Stein 13 months to complete. This egg is also located at the Fabergé Museum in St. Petersburg. Many of the eggs he created for her included surprises related to her personal life such as images of her son and his family or, in the case of the Caucasus egg from 1893 by workmaster Michael Perkhin, an image of the house where her son, the Grand Duke George, spent a large part of his life upon being diagnosed with incurable tuberculosis. The last egg, made in the year of the October Revolution, was named the War Egg. Forty-two of the original Easter eggs still remain spread out across the world. The others were stolen during the Russian Revolution. The Russian Revolution ended the tradition of the imperial Easter eggs. The final egg from the historical Fabergé workshop under Peter Carl Fabergé was the Constellation Egg, which should have been presented to Tsarina Alexandra for Easter in 1917. It featured an engraving of the constellation of Leo, alluding to the birth date of Tsarevich Alexei, heir to the throne. Shortly before it could be completed, however, the Russian Revolution broke out. Subsequently, Tsar Nicholas II abdicated, the imperial regime fell, the Fabergé family went into exile, and the Constellation Egg vanished. The Constellation Egg resurfaced in 1922, though only in correspondence between Eugène Fabergé and François Birbaum, Fabergé’s chief designer from 1895 to 1918. In this letter, Birbaum described the egg as comprising blue glass on a cloud-shaped pedestal of opaque rock crystal. Travelling at the speed of light, light from a star can take decades to reach the earth. The light leaving the brightest star in the constellation of Leo in 1922, when that letter was written, would only have reached the earth in 1999. And as fate would have it, in 1999 the original drawing of the Constellation Egg came to light, confirming Birbaum’s description. Just two years later, benefiting from the original drawing, the incomplete pieces of the Constellation Egg — the clouds of rock crystal and two empty halves of a blue glass egg — were identified in a storeroom of the Fersman Mineralogical Museum in Moscow. In 1918, Fabergé fled Russia after the Bolsheviks nationalized his business. He settled in Lausanne, Switzerland, where he died on September 24, 1920. Victor Mayer was a Fabergé workmaster, the term used for the overseer of the workshop and craftsmen, from 1990 until 2015. Managed by Dr. Marcus O. Mohr, a fourth generation Mayer, Victor Mayer created a new generation of eggs, starting with the first post-revolutionary egg presented to Mikhail Gorbachev as he received the Nobel Peace Prize in 1991, the Gorbachev Peace Egg. The eggs are the most complicated objects that Victor Mayer manufactured under the Fabergé label (it also manufactured enamel jewelry, watches, and other objets d’art). One example makes it clear why this is so: one of Victor Mayer’s Fabergé eggs features a winter scene with a family of polar bears when the top of the egg is opened. The “snow” covering the bottom of the scene inside the egg is in reality rock crystal taken directly from a druse. In order to find just one perfect piece to use as snow, five to ten druses must be opened and thoroughly examined. The most complicated mechanical egg Fabergé ever created was completed in collaboration with workmaster Victor Mayer and master watchmaker Paul Gerber of Zurich: the Moon Phase Clock Egg from 2001. The Pearl Egg of 2015, a breathtaking unique piece, revived the tradition of the imperial eggs under Fabergé’s new owner, Gemfields. However, instead of being created for Russian royalty, the owner of this latest egg is Hussain Ibrahim Al-Fardan, a man from a family of one of the oldest and the most successful pearl traders in the Gulf region (see Fabergé Pearl Egg: The First Imperial-Class Egg In Nearly 100 Years). We can only hope to see more of these in the future. For more information, please visit www.faberge.com/news/49_imperial-eggs. * This article was first published on April 14, 2017 at A Brief History Of Fabulous Fabergé Eggs.